Are you on a “New Year, New You” quest? If you are starting 2019 off with a Whole 30 elimination program, the Sense Of Mind Essential Oil Survival Kit is the PERFECT companion! The kit includes 4 doTERRA Certified Pure Therapeutic Grade oils at wholesale prices (a savings of $23). Cutting gluten, carbs or sugars can be tough on your body and mind. The Survival Kit includes 4 essential oils to support digestion, relieve headaches, fight sugar cravings and counteract negative emotions. Let’s explore these oils and how they support the journey. Helps relieve a headache, soothes an upset stomach and boosts your energy when fatigue sets in. Supports digestion, cleanses and purifies, supports your immune system and uplifts mood. Balances blood sugar levels, fights sugar cravings and eases the desire for binging. Promotes feelings of relief and patience and counteracts negative emotions of anger and guilt. The Essential Oil Survival Kit is the perfect companion for your New Year’s elimination diet. These oils were carefully curated to support digestion, relieve headaches, fight sugar cravings and counteract negative emotions. 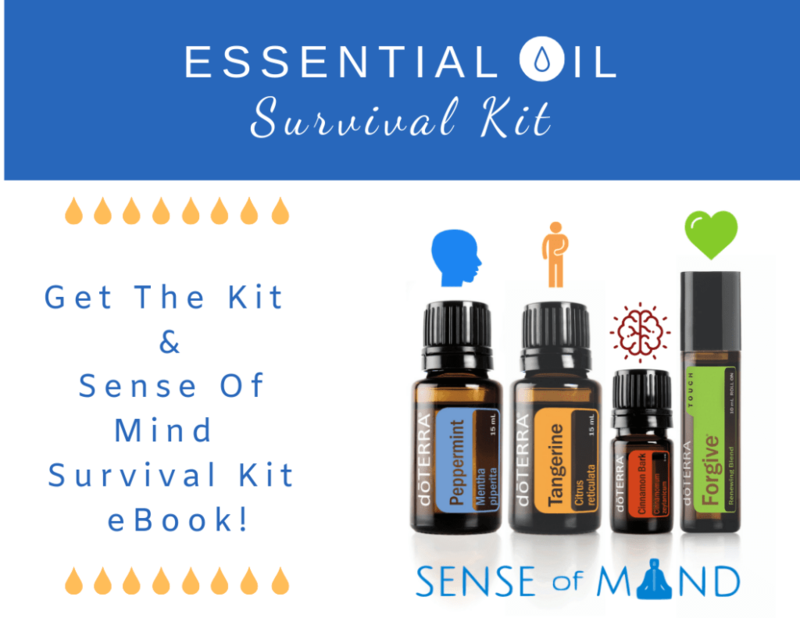 You also receive the exclusive Sense Of Mind Essential Oils Survival Kit eBook covering the basics of essential oil use and how and why to use each oil in the kit. I am also offering a free 1-1 doTERRA Wellness Consult to help you create your New Year wellness plan. Here’s to YOU and your #healthstyle! Price includes shipping and taxes. Please allow 3-6 days for shipping.